The Eagle’s, player spotlight falls on Tayson Wilson. 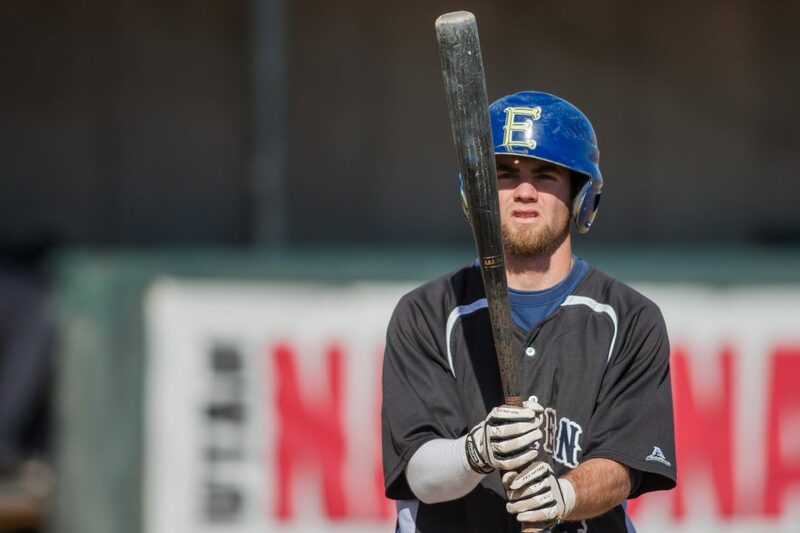 He is a sophomore member of the USU Eastern baseball team. Baseball has always been part of Wilson’s life and it runs in the family. His dad played for Dixie State when it was a junior college and then went on to finish his career at Southern Utah University. Wilson followed in his father’s footsteps by playing baseball at a collegiate level. However, Eastern was not his first choice when it came to going to school and playing ball. He spent a year in Texas at Tex Arkana Junior College, a JC about the same size as Eastern, playing baseball until the program got shut down and Wilson had to find somewhere new to play if he wanted to continue his baseball career. Luckily, Eastern was a perfect fit. Wilson can be found on the field wearing No. 4 and playing in the outfield. When he first came to Eastern, he played second base, maybe that is why the Boston Red Sox’ second baseman Dustin Pedroia is his baseball hero. As the season got under way, however, Wilson was moved to an outfield position. He has a batting average of .259 and four RBIs on the season. He is also 4 for 4 on stolen bases. Wilson’s quickness both in the field and around the bases could help the Eastern team out this season. “Turning double plays use to be the greatest thing when I played infield, but now that I am an outfielder, I like making diving plays,” Wilson said. He also loves the team he has at Eastern and says baseball is great. He will graduate with his associate’s degree this May and since his time at Eastern will be over, he plans on serving a mission for the Church of Jesus Christ of Latter-day Saints, and then returning home to attend a college where he can get a four-year degree in business. Like most athletes at Eastern, Wilson didn’t grow up only playing baseball. During his years at Fremont High School, he was also a member of the football team and still enjoys many other things from his younger years. He loves to hunt, run, read and build stuff. Right now in his life, he has an obsession with Duck Dynasty and never misses an episode. In fact, his goal in life is to one day grow a beard like the men on the show.